February 15 is National Flag of Canada Day. Although this holiday doesn't have a status of a statuary holiday, the day that commemorates the flag of Canada has been celebrated for decades. The inauguration of modern flag of Canada (the Maple Leaf flag replaced the Red Ensign) was on February 15 in 1965. This flag was proclaimed by Elizabeth II, Queen of Canada on January 28 in 1965 and the law took effect only in February. There were some controversies about the name of the holiday. The name “National Flag Day” would not be acceptable, as far as some aboriginal peoples consider themselves as First Nations and also some institutions are designated national. As the result, the words “of Canada” had to be included, that made clear to what nation the holiday refers to. Anyway, today National Flag Day and simple Flag Day are used in common practice to describe the holiday. 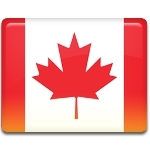 National Flag of Canada Day is not a holiday, although it is celebrated with different events around the country. During the long history of celebration, the ceremonies were held in Ottawa, Quebec, Winnipeg, St. John, Vancouver, and Whistler.